Our members asked some tough questions and have been giving us some great feedback for our 2016 Annual Meeting with Commissioner Catherine Smith. The below article published in the Greenwich Time summarizes Commissioner Smith’s talking points. We encourage you to comment below. Click here for Commissioner Smith's PowerPoint presentation from our meeting. 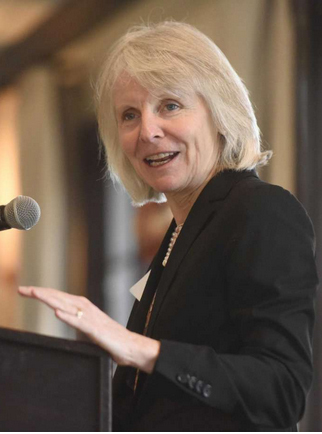 Concerns about estate taxes pushing high wage-earners south and General Electric’s departure fueled questions to Catherine Smith, the commissioner of Connecticut’s Department of Economic and Community Development, at a Greenwich Chamber of Commerce meeting Wednesday. “You guys are asking all the hard questions,” Smith joked while fielding blunt questions about the state’s future. For a second year, Smith spoke to the chamber about the condition of the state’s business climate. Her remarks focused on ways Gov. Dannel P. Malloy's administration is responding to the wants of businesses when building a home for their companies. “My private-sector background showed me that if you don’t know what the customer needs, you can’t serve them,” she said. Her presentation began with a defensive, though friendly, reminder that “there’s a lot of good news, but it’s hard to remember how much better it actually is now,” she said, referencing the contrast between now and the period just after the Great Recession. “Fiscal woes continue,” she said, adding that Malloy would release a state budget in February that will include some of his plans to resolve severely underfunded future liabilities. Smith also discussed Malloy’s plans for improving the state’s outlook. “The plan is to invest heavily in areas that drive the economy,” she said. These include initiatives to graduate more students steeped in STEM, and spur business growth through programs like Small Business Express and First Five Plus. Small Business Express provides loans and grants to small businesses while First Five Plus is geared toward big businesses, such as Greenwich-based hedge fund AQR Capital Management, which recently received a commitment for millions in state incentives to create at least 200 jobs. “A lot of lessons were learned” from GE moving to Boston, Smith said, so “we’re being proactive to work with others to make sure they know they’re loved.” But she told the crowd that she wasn’t sure Connecticut had any chance to compete for GE. Infrastructure marks another major recipient of state investment. In response to a question about stemming the outflow of wealthy homeowners, Smith said it’s not possible to stop them all, but already Malloy has put a cap on the estate tax and he’s considered lowering the cap more. “We’re confident we can set up the state for a healthy financial future,” she said. Click here for the original Greenwich Time article (with more event photos). For more photos taken at the event visit our Photos page.